Hi friends! 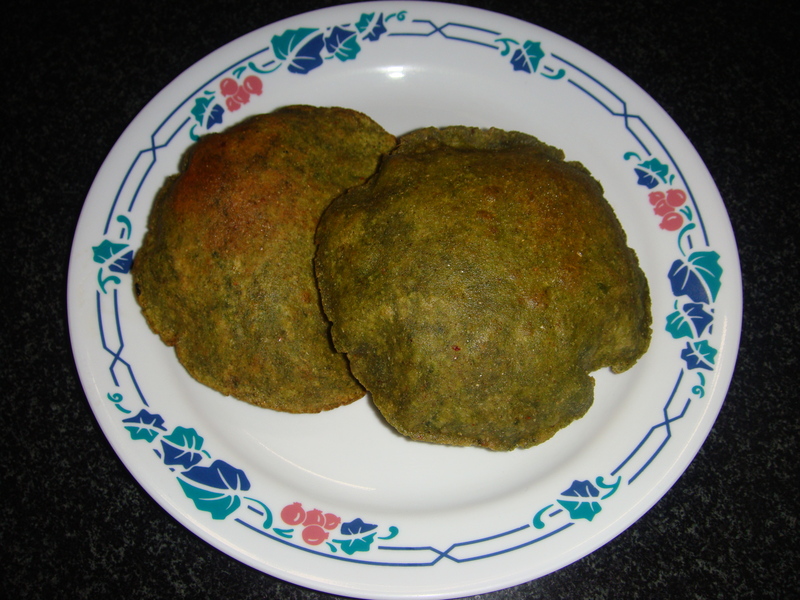 Enjoy poori made with spinach dough. Spinach is an excellent source of vitamin K, vitamin A (in the form of carotenoids), manganese, folate, magnesium, iron, copper, vitamin B2, vitamin B6, vitamin E, calcium, potassium and vitamin C. It is a very good source of dietary fiber, phosphorus, vitamin B1, zinc, protein and choline. In a bowl, mix together whole wheat flour, and salt, coriander powder, green chili paste, cumin seed powder , add Olive oil to the mixture, using fingers, mix in oil till it resembles bread crumbs. Add palak leave puree. Slowly add about half a cup of water or little more, just enough to form a firm/ stiff dough and knead till smooth. keep aside for 10 to 15 minutes. Divide the dough into small lemon size, equal portions, and roll out into 3″ rounds on an oiled board. Drain on absorbent paper kitchen towel lined plate, so that puris are dry, without excessive oil. Serve hot, goes very well with Vegetable, potato stews / aloo sabzi etc.